The first single, "Three (Everyday)", off the CD, Fractured Image. The track features The Hooters' Fran Smith, Jr. on bass, Steve Butler (Smash Palace) on lead guitar and Andy "the funky drummer" Kravitz on drums. 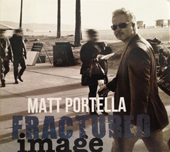 Check out Matt's video in support of his CD, "Fractured Image", featuring the single "Funeral", and Matt's explanation of what makes his style of music "pure.acoustic.energy."